Don’t laugh but I’m working on Feng Shui-ing my house. When Jack and I were still doing fertility treatments we tried everything anyone could think of to get knocked up. Several well wishing friends prayed for us and gave us various fertility items from catholic medals to pagan fertility gods. Of course nothing helped but it felt good to be literally be trying everything (well almost everything, I never tried lucky socks because I HATE to wear them and only do when I’m at work or exercising). Even though I am a bit of a skeptic I always tried the next thing people suggested to me. One friend suggested we feng shui our bedroom to make the energy in our room more fertile. So I bought a book, did extensive research, rearranged our bedroom, added certain items and decluttered the closet (which is very important in feng shui). I noticed a huge difference right away and I felt so much better about everything when I was in our bedroom, life was literally better in that one room of the house. I think the thing I like best about the practice is that its based on the mind body connection, which I am a huge believer in. As a nurse I have seen way too many examples of this to not believe in it. I am also extremely sensitive to my environment and the energy present in the environment. When our living room was under construction for 2 years it was a huge drag on my mood to walk in everyday and have that be the first thing I saw. So feng shui combines the mind/body connection and the energy in your surroundings, what’s not to like? I realize that putting a fish in a certain part of the room can’t make me have a baby but it can make me feel at peace and harmony in my environment. I think the best thing about this overhaul is that I’m finally feeling free to explore my spiritual side which I have avoided like the plague since I was a young. I grew up in a somewhat repressive religion so all organized religion tends to leave a sour taste in my mouth. I have always associated spirituality with the practice of religion so I avoided anything with the slightest hint of spirituality. My struggle with infertility really made me feel my lack of spiritual development. I’m finally coming to realize that embracing my spiritual side can mean many things and this project is really helping with that. These muffins are pretty mediterranean diet friendly but could be more friendly if you substituted the regular milk for almond milk or something similar. As it is they use avocado to replace butter which is a great source of monounsaturated fat, supposedly the best for you. Mix your dry ingredients together in separate bowl. Mix avocado and sugar. Add egg, then milk, then molasses. Stir in dry ingredients. Stir in blueberries and nuts. Bake at 375 for about 20 min. Bake in large batches to freeze for breakfasts during the week. This has not been a great week. The roof cost has gone from 6500 bucks to 9000 bucks due to unforeseen complications and it won’t be ready to list next week. The roof issue has managed to drain all the savings we had built back up since stopping fertility treatments. I could cry. Things have been stressful at Jacks work. Several months ago the salesman at work was told they wanted to expand Jacks department (which consists of Jack) and to go out and get work. Jack and the salesman managed to get several big number jobs lined up and then management changed, and the new manager decided he didn’t want to expand Jacks department despite the wishes of upper management. The result? Way too much work for one man and some untrained temps and a lot of underhanded sabotage attempts being made by the new manager. Now that he is getting caught at it, he is blaming everyone around him. Everything came to ahead last week and now Jack gets to work even more overtime to catch up. In case you were wondering… the manager still has a job. Life has been moving along lately..
My nephews are in town from California, my sister has 4 kids and it is definitely chaotic. We celebrated our wedding anniversary yesterday on the 4th and are planning a weekend getaway this weekend. I have an interview on thursday for a nurse educator job. Frankly I’m surprised I got an interview since I haven’t finished my masters yet so my hopes aren’t that high. We just shelled out 6500 bucks to replace the roof of our rental and soon-to-be-on the market house. Fingers crossed it sells fast and we get our money back. Work continues to be crazy for the both of us. Still short staffed, still working too many hours. We survived the “Great South West Heat Wave” but the summer isn’t even close to over so we have 2.5 more months of yucky hot weather to get through. Thats it for now. Hopefully we can make it through the summer in one piece, work will calm down and we sell our house. Just a quick post to document the start of the project “Custom Bug for Evan”. 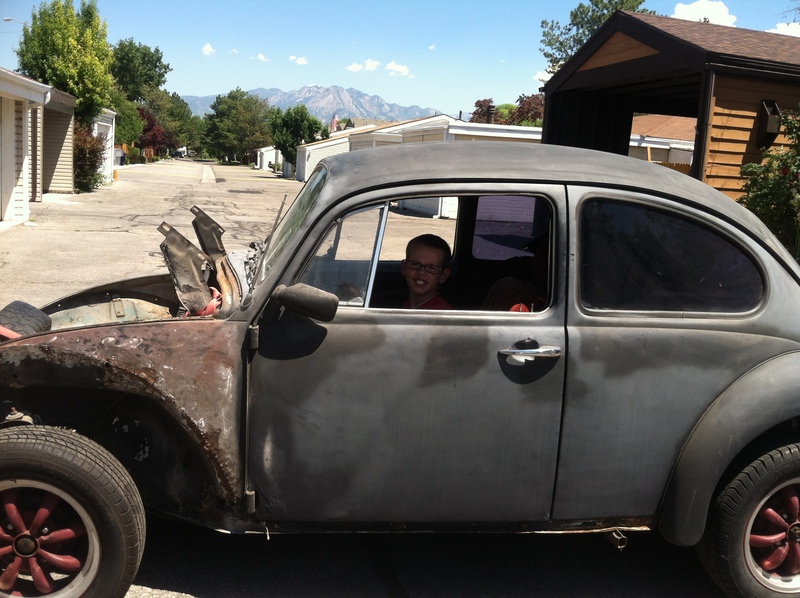 Jack is fixing up this 72 bug for my 9 y.o. nephew Evan. 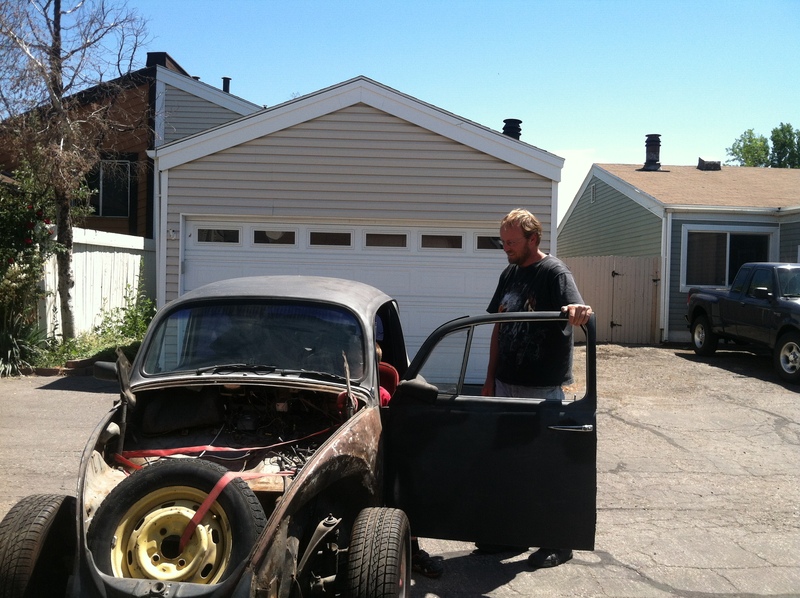 Today we gave Evan his bug and Jack and Evan spent an hour talking about how they were going to fix it up. Evan has requested “Yellow with black stripes” for the paint job. Jack is such a good uncle and Evan definitely needs a positive male role model in his life. Can’t wait to document the progress.